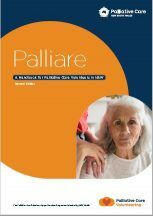 “Palliare: A Handbook for Palliative Care Volunteers in NSW” offers background and practical guidance for people who volunteer in Palliative Care settings. Some of the information is specific to NSW but will be of interest to Hospice and Palliative Care volunteers everywhere. The Second Edition of Palliare was published in August 2018. 1. Free – Download the Second Edition PDF (please click on the blue text to download). 3. Buy the print Book. Contact us for more information.